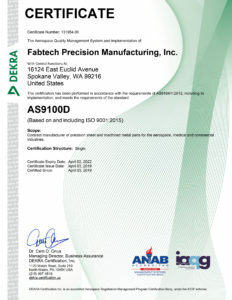 Fabtech Precision Manufacturing is certified to ISO 9001 : 2015 and Aerospace Standard AS9100 Rev D. Additionally, Fabtech is an FDA registered and inspected facility with implemented Good Manufacturing Practices (GMP), and maintains a Medical Device ISO 13485 : 2016 / 21 CFR 820 compliant quality system. Fabtech Precision Manufacturing is uniquely equipped to manufacture your quality-critical project, with state of the art equipment capable of industry leading tolerancing and capability, and highly trained and experienced staff that are prepared to procure, manufacture, verify, and deliver product that meets and exceeds your requirements. Fabtech’s vision is to be a leading value supplier of exceptional quality metal components to the Aerospace, Medical and General Industry. Our leaders are committed to our core values of reliability, respect, integrity, and compliance. They behave according to those principles and support driving all aspects of the Fabtech Operating System to create the greatest level of improvement and success for all employees and for the future of our customers, our company, and our products. We, the employees of Fabtech, proudly assert our personal commitment to understand, meet, and exceed our Customer’s Requirements. We will foster an environment for continuous improvement in all operational areas, meet applicable regulatory requirements, and comply with our internal standards and procedures. We are dedicated to delivering defect-free product on-time at the most competitive cost possible.